WASHINGTON (CNS) -- Amid a federal judge ordering the government to broaden the exemptions to the immigration travel ban upheld partially upheld by the Supreme Court, Catholic and Lutheran leaders lamented that the immigration cap had been reached for refugees without such exemptions for the 2017 fiscal year. 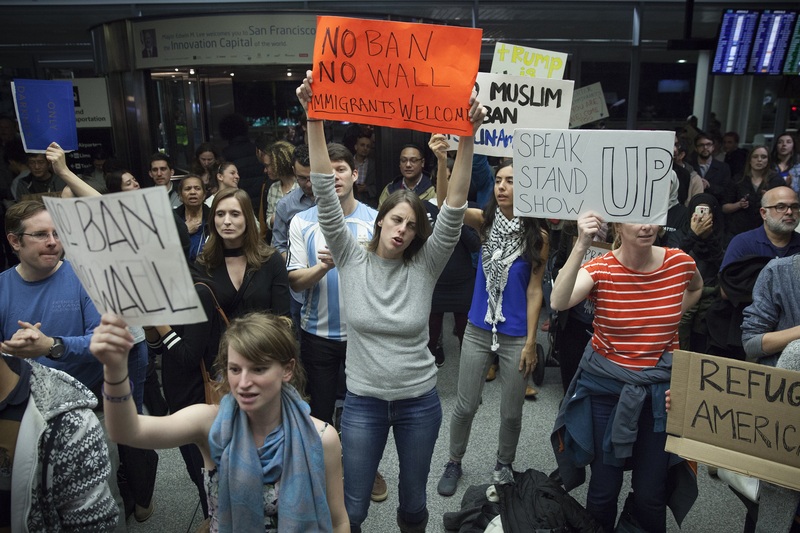 The federal government suspended travel July 12 for refugee immigrants without close family connections after confirming that 50,000 refugees—the limit imposed by President Donald Trump in a March 6 executive order—had arrived on U.S. soil. "We remain deeply troubled by the human consequences of the revised executive order on refugee admissions and the travel ban," said Bishop Joe S. Vasquez of Austin, Texas, chairman of the U.S. bishops' Committee on Migration, in a July 13 statement. "Resettling only 50,000 refugees a year, down from 110,000, does not reflect the need, our compassion, and our capacity as a nation," Bishop Vasquez added. "We have the ability to continue to assist the most vulnerable among us without sacrificing our values as Americans or the safety and security of our nation." "The pause on resettlement and restrictions on the number of persons who can enter our country as refugees will have an immediate effect on our ability to conduct the lifesaving work of providing safety and protection," said a July 12 statement by Kay Bellor, vice president for programs of Lutheran Immigrant and Refugee Service, which is second only to the U.S. bishops' Migration and Refugee Services in the number of refugees it helps resettle in the United States. Trump's travel ban, which had been shot down by a number of federal courts, was partially allowed June 26 by the Supreme Court, which exempted from the ban those refugees having "bona fide" relationships with someone already in the United States. The government listed parents, spouses, children, adult sons or daughters, sons- and daughters-in-law, siblings, fiances, fiancees and in-law parents as the exemptions. Watson's July 13 order is in place unless the federal government appeals it. The Supreme Court this fall will hear oral arguments in the travel ban case, which included a 120-day ban on all refugee resettlement and a 90-day ban on refugees from Iran, Libya, Somalia, Sudan, Syria and Yemen—all of which are Muslim-majority nations. "As Bishop Vasquez said, it's very sad, deeply troubling," MRS executive director William Canny told Catholic News Service July 14. "These are not dangerous people. These are people who fled danger. They're in danger of further exploitation. They need to get out of this situation and restart their lives—and they have family there that we know." Canny said a widening of exemptions means it is likely that more than 50,000 refugees will come into the United States during the current fiscal year, which ends Sept. 30, but that "tens of thousands" more refugees who have been fully vetted are still waiting in refugee camps. "What we're advocating for is 75,000" refugees to come into the United States during fiscal 2018, Canny told CNS. "We understand that the administration has security concerns. The administration made some initiative to reduce the number of refugees coming into the country. We don't agree with it, so at a minimum, we think we should be bringing in 75,000." Bellor agreed with the 75,000 figure, noting the number is "less than the need." Citing United Nations World Refugee Day figures, "the numbers are definitely not shrinking," she said. "The number of people on the move is 66 million." The upheavals in refugee and immigration issues over the past six months has been "devastating" to Lutheran Immigrant and Refugee Service field staff, Bellor said, as they are the workers being laid off. "It's been horrible in terms of stops and halts to the program. A lot of workers in the field are former refugees, right? You're letting go a lot of institutional and program knowledge."